If you are checking the recipe in the Blue Book for the Cross-Bones cookies, the instructions omit when to add the eggs. Add them after the sugars and butter and peanut butter are creamed. 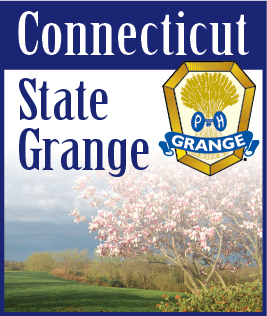 Since there is to be NO Pomona judging of needlework, each Subordinate Grange will be responsible for getting their entries to Cheshire Grange for judging on June 9, before 11:00 a.m. I would suggest that several Granges pool their entries and designate one person to deliver them. Make sure labels are securely attached including readable names and Granges. They will be on display through Sunday at “Celebrate” and can be picked up afterwards. The same rules apply for the craft and door decoration contests. Remember you do not get the craft entries back as they go to the Big E for sale at the Country Store. Good luck to all.